Want to add some square footage to your living room and kitchen? Instead of a contractor, consider hiring a landscaper. These days, the backyard has become an extension of a home’s living space, with elaborately landscaped patios and decks and outdoor kitchens that put a charcoal grill to shame. And if you’re looking to sell, staging a home’s backyard is a great way to set your listing apart and help a buyer fall in love with your home, indoor and out. 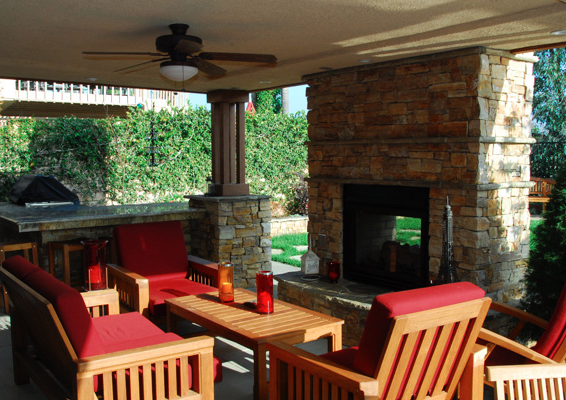 With the Bay Area’s idyllic weather and beautiful scenery, outdoor home improvements are a no-brainer. Here are five ideas from Planet, a landscapers trade association, to help turn your backyard into a top-notch entertaining space for year-round relaxation. BARBECUE GRILL AND BEYOND: Outdoor kitchens become the center of family life in the summer. They can be as simple as a patio with a grill and table or as lavish as a complete kitchen made of stone or brick, with a stove, oven, counters, sink, and refrigerator. MOOD LIGHTING: Outdoor lighting shows off landscaping and illuminates walkways and porches, adding curb appeal and increasing safety. So-called “nightscaping” can make your backyard a more pleasant place to hang out once the sun goes down. A set of solar walkway lights adds an eco-friendly touch. LIGHT A FIRE: Whether you opt for a portable fire pit or a sturdy stone fireplace built into a wall, a cozy fire is a natural conversation aid. It also helps extend evening entertaining well into the fall and winter. CALMING WATERS: Consider adding a water feature, such as a pond, a water wall, or a fountain. This amenity can help instill your backyard with a sense of tranquility and might also attract wildlife. BEAUTIFUL WILDFLOWERS, HERBS: Wildflowers or herbs are beautiful and fragrant, whether as container gardens or ground cover. These gardens also benefit the environment and small animals, which can use the garden as a source of food and shelter. You can also use an herb garden to spice up your own meals. MORE FROM THE PLANET WEBSITE: For plenty of landscaping ideas and smart outdoor-care tips, spend some time perusing the complete Planet website. Topics include child- and pet-friendly yards; caring for plants, trees, and grass; seasonal advice; sustainable landscapes; water-saving tips; green roofs; and indoor plants.